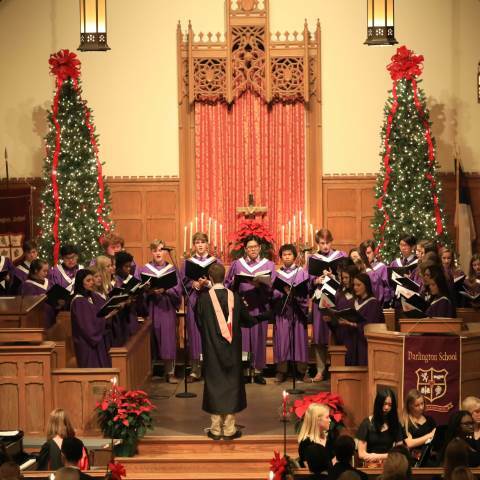 Darlington School will officially welcome the holidays this year with the 35th annual Festival of Lessons & Carols, which returns to Morris Chapel on Sunday, Dec. 9, at 7 p.m. The free event is open to the public and sponsored by the Darlington "Y" Cabinet, and will be led primarily by members of the student body. The order of service is centered around nine biblical lessons that tell the story of the birth of Christ, with musical interludes between each narrative. The holiday concert will feature the 4th and 5th Grade Choir, the Concert Choir and the Darlington Orchestra. Among the featured congregational hymns are Christmas classics including "Joy to the World," "O Come, All Ye Faithful," and "Hark! The Herald Angels Sing." Following the service in Morris Chapel, the congregation will sing carols outside as the school's Great Tree is lit, a tradition that was started by the late Dr. and Mrs. E.L. Wright. Dr. Wright served as Darlington's headmaster from 1920-54, and as president from 1954-63. After the tree has been illuminated, guests will be invited to enjoy hot chocolate and other refreshments in The Cove. Originally an Anglican church service, the Festival of Lessons & Carols has expanded to schools and universities worldwide that encompass a variety of different affiliations. The program dates back more than 125 years to Truro, England, and was adopted in 1918 by King’s College, Cambridge University. Lessons & Carols garnered worldwide fame after the BBC first broadcast the service in 1928. For those who are unable to attend, Lessons & Carols will be streamed live on this page. A recording of the full service will be made available online afterwards.